The Corporation of Trinity House of Deptford Strond, known as Trinity House, was formed in 1514. It's job is effectively marine safety: it is the official General Lighthouse Authority for England, Wales, the Channel Islands and Gibraltar; it suplies pilots; and works as a charity for youth training and retired seafarers. This coin was produced to celebrate the 500th Anniversary of Trinity House. The reverse was designed by Joe Whitlock-Blundell with the help of David Eccles. The beacon of a lighthouse shining out to left and right. Surrounding inscription "1514 TRINITY HOUSE 2014" with "TWO POUNDS" below. The milled edge has the inscription "SERVING THE MARINER". 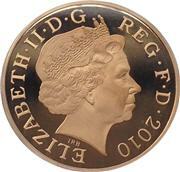 The obverse is the Ian Rank-Broadley portrait of Queen Elizabeth II. Mintage: 3,705,000 (may include coins issued as part of a set). Minted at The Royal Mint. The current Two Pound (£2) coin that is found in circulation is a bimetallic coin introduced on 15th June 1998 (although the first are dated 1997). 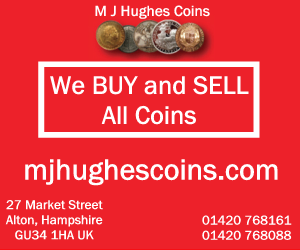 There are almost 500 million £2 coins of various designs in current circulation. There has been other two pound coins. 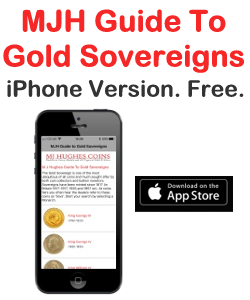 From 1823 until 1996 they made occasional appearances and the double-sovereign has a two pound value. Commemorative two pound coins were issued from 1986 to 1996. This article is primarily concerned with the circulating coins of 1997 onwards. The two pound coin has also been minted in gold. 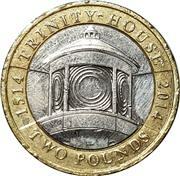 2014 Trinity House £2 Two Pound Coin. Collectable coin. Circulated.